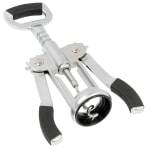 Corkscrew, Premium, Winged Type, Bottle Opener. "Once you have pulled the cork out, you can't get it unscrewed from the worm since the worm comes unscrewed from the body. Terrible. I wish I coul..."
"This corkscrew has a poor design. After removing a cork from a bottle, when trying to remove the cork from the corkscrew the screw part itself un..."
"Once you have pulled the cork out, you can't get it unscrewed from the worm since the worm comes unscrewed from the body. Terrible. I wish I could give it zero stars." "This corkscrew has a poor design. After removing a cork from a bottle, when trying to remove the cork from the corkscrew the screw part itself unscrews from the main part of the device. Three bottles of wine and it did it every time."